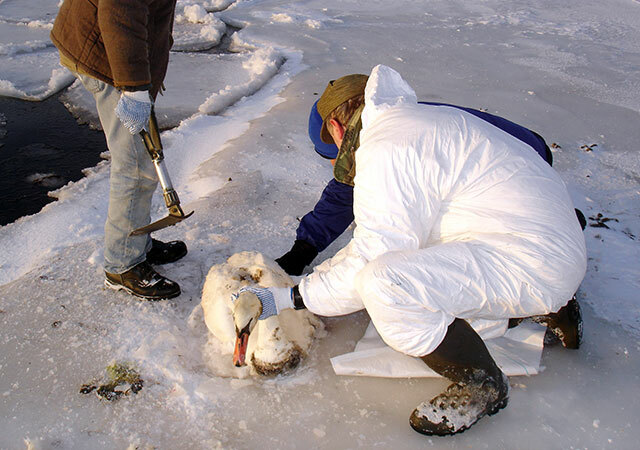 Team members work carefully to rescue a Mute Swan that was stuck in ice after being oiled in Estonia. International Bird Rescue (IBR) started off its 35 year anniversary by responding to an oil spill in Estonia which oiled hundreds, possibly thousands, of seabirds and swans. As co-managers of the International Fund for Animal Welfare’s Emergency Relief Team (IFAW) IBR provides substantial expertise for the international team. On January 28, 2006 an oil slick was discovered on the northeast coast of Estonia and on islands in the Gulf of Finland. Estimated at 20 tons, the oil from a yet to be determined source killed thousands of birds who winter there, and left many survivors in need of rescue. When the size and impact of the spill became apparent, the Ministry of the Environment and the Estonian Fund for Nature requested help. A week after the spill, the IFAW ER Team was mobilized and on the way to Tallinn, Estonia. Project Blue Seas from Germany and RSPCA, England are also on-site and have been incorporated into the overall response team. 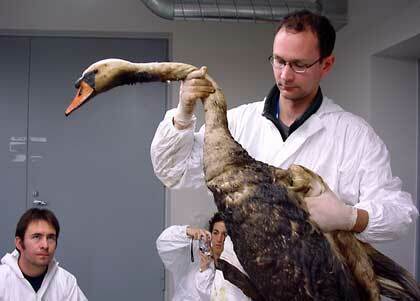 Heavily oiled Mute Swan is stabilized and ready to be washed at Estonia spill in 2006. Hitting the ground running, the Team evaluated what had already been done and determined the course of action necessary to coordinate the efforts of local organizations and volunteers to set up one centralized center. This would put all rescued birds in one place where the ER Team could give them the best care possible, greatly increasing their chance to survive the life-threatening ordeal. Within 48 hours of arrival, a building in Keila, 30 minutes from Tallinn, had been set up and the first birds started arriving from several temporary centers, including the Tallinn Zoo. A modern building, loaned by the Estonian Ministry of the Environment, was quickly converted into rehabilitation rooms for the oiled birds, a wash room and a food preparation kitchen. Pools were erected and enclosed in a large tent for reconditioning the birds after cleaning. Storage tanks for oiled waste water were put on the site and a comprehensive site safety plan was developed. The Team was able to accomplish this with considerable help from the Estonian Fund for Nature and the Estonian authorities. A dozen plumbers, electricians and carpenters worked in sub-zero temperatures to get the center up and running in record time. For oiled birds, there is a very small window of time in which they can be saved. On February 10, the center had 103 birds in care, including 22 mute swans, a species that is has “threatened status” in this part of the world. As with most oil spills in winter, rescue teams face dangerous challenges due to ice that freezes and thaws and hard to reach areas with snow over ice. Many birds, too weak to move, were freezing into ice while still alive. Amazingly, swans that had to be carefully chipped from the ice are surviving and recovering well. Battling freezing temperatures, Mute Swans needed quick attention to save these threatened birds. The spill has covered a relatively small distance of coastline of about 18 km long, including the nearby islands, but the area is heavily utilized as a foraging area for seabirds this time of year. Rescue teams combing beaches saw approximately 50 swans that are oiled and in need of rescue. However, if oiled birds are able to fly, capture can be difficult. A boat was made available to the rescue team, but it is extremely difficult to get to the oiled birds in the icy conditions. On several occasions a team member has had to wade into freezing water waist deep to rescue to a bird. Six days after arrival, the Team has birds stable enough to be washed. Many are very heavily oiled but they will come clean when the experts begin washing them. Swans that look black will again be snow white. After washing, the birds go under dryers which dry their wet feathers while they preen them back into place. At this point many birds will feel quite good and will be able to feed themselves. When deemed ready, the birds will go into the outside recovery pools, where they will continue to preen and regain their waterproofing. In a week (February 17) some may even be ready for release. However, there is a serious concern that oil trapped in the ice will become a hazard to seabirds again when it begins to melt in the spring. Local volunteers are receiving training at the center to be able to help this second phase of oiled birds who will need rescue and rehabilitation. 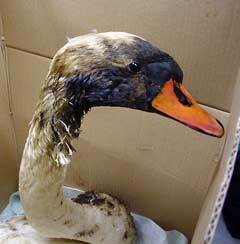 Bird affected by the spill include: Long-tailed Ducks, Mute Swans, Golden-eyes and Smews (Eurasian diving ducks). IFAW’s Emergency Relief team includes veterinarians and wildlife rehabilitators from International Bird Rescue Research Center (US) and others from around the world, including Brazil (IFAW Penguin Network and CRAM), IFAW Russia and IFAW Germany. The team is working with the Estonian Fund for Nature the Ministry of the Environment, Project Blue Seas (Germany), SEA ALARM (Netherlands and Belgium) and the RSPCA (UK), as well as local volunteers. IFAW’s Emergency Relief (ER) Team is managed cooperatively by International Fund for Animal Welfare (IFAW) and the International Bird Rescue (IBR) which brings over 30 years of experience responding to oiled wildlife. The team is comprised of leaders in the field of wildlife rehabilitation, biology, veterinary medicine and management who are professionals from Australia, Brazil, Canada, Germany, South Africa, UK and USA.